Led by Christy Edstrom O’Hara, Assistant Professor of Landscape Architecture, Cal Poly San Luis Obispo. The evolution of the Palos Verdes Peninsula extends over 100 years and continues today. 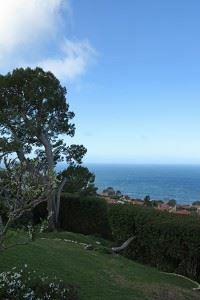 Palos Verdes was conceived as a totally planned community. Its meticulous design was developed by the Olmsted Brothers landscape architecture firm as Directors of Design, along with city planner Charles “Harry” Cheney, and architect Myron Hunt. Eventually known as the Palos Verdes Ranch Project, the suburban community was designed during a critical period of regionalism, in which the creators sought to express American design values that were distinctively Californian. This Tour & Talk will include discussion of community design development from 1914 – 1930. The village center, Malaga Cove, was the only village built per the original 1920s plans. Laid out like an Italian hill town, our walk will begin at the central plaza and extend from the high point of Farnham Martin Park to the beach at the end of the tour. We will have a picnic lunch in the park; the adjacent Myron Hunt-designed library offers period interiors for our review.